Today I visited an exhibition of the work on paper of this Japanese Canadian artist at the McMaster Museum of Art in Hamilton, Ontario. I was absolutely in awe of his graphite drawings of the Prairies and water-colours of Islands. Here are some examples, photography was not allowed in the exhibition so I have borrowed the images from the internet. The photos do not really do justice to the artistry but I will try to explain what you can see whilst viewing the original works. I am somewhat qualified to do so having worked as a conservator of paintings for many years and also being an amateur water-colourist. This drawing “Inside Passage” is on paper with a water-colour under-painting, I think just of Ultramarine Blue with maybe a touch of Indian Yellow added to lean it towards green. This under-painting is almost continuous in the sky, though vague areas are left blank to represent clouds. The colour is continued through the area of distant hills and in the top third of the lake water below the dark hills. Tanabe must have used a large brush, possibly having wetted the paper first to achieve an even spread of the colour wash. Afterwards, when the paper was completely dry, he has added layers of graphite powder using a soft brush and also using a graphic stick/pencil. In some areas, he may have erased areas again to achieve the lighter strokes in the sky. In the lake water, it looks as though he has repeatedly cross-hatched to represent deep, dark water. Again the dark hills are hatched over and over to give the depth of dark forests and the skyline is rich with strokes representing the movement of branches and birds. Altogether it demonstrates consummate skill in both wet and dry media. 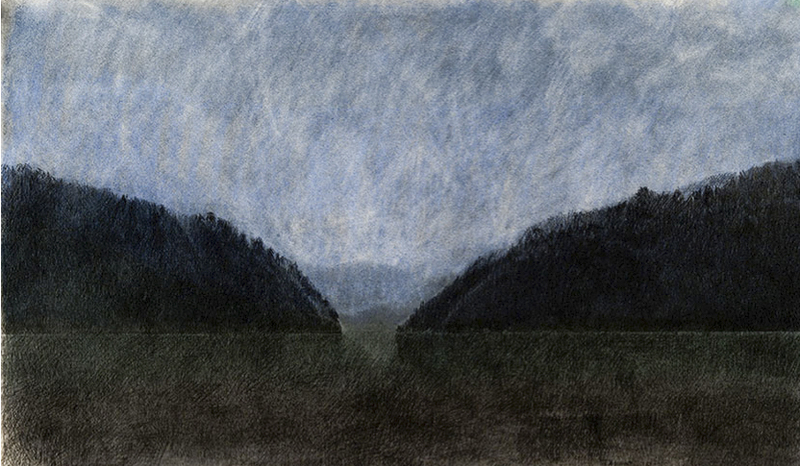 In this drawing ” Foothills South of Pincher Creek”, Tanabe uses a fine graphite pencil throughout and simply adjusts the angle, thickness, pressure and direction to portray the rain-soaked sky and stretched out foothills. Another in this series shows that Tanabe has used the same blue/green as in the “Inside Passage” under-paintng wash just in the hills, it is very subtle, hardly noticeable but it lifts the land mass away from the sky and water. I saw another work, a small water-colour painting of the morning sun rising from the sea near a string of islands on the horizon. Sadly I could not find an image of it on the internet but it was a delight of restraint. The scene was depicted adroitly with probably just two colours, Yellow Ochre and Payne’s Grey. Yellow wash was applied over the whole paper, then when dry, an extremely thin wash of Payne’s Grey in the sky, carefully keeping above the horizon and allowing the wash to pool slightly in the rough texture of the paper. Finally the islands were painted in with a fine brush, simply silhouetted against the sky. In daylight I will take a photo of the image from the catalogue.